Today, Google announced that the ‘Fact Check’ feature is now available not only in Google News but also in Google Search and in all languages. 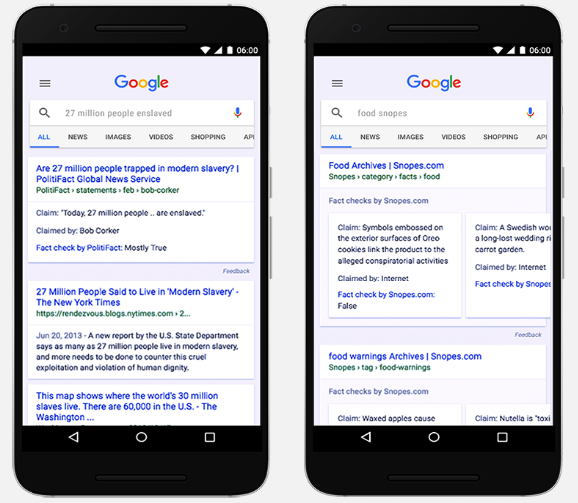 ‘ when you conduct a search on Google that returns an authoritative result containing fact checks for one or more public claims, you will see that information clearly on the search results page. The snippet will display information on the claim, who made the claim, and the fact check of that particular claim.’ These fact checks are not Google’s; they are provided by content publishers and in some cases the same claim might be fact checked by more than a publisher. Generally, ‘If a site has fact checked a claim related to your search, you might see a search result with a box that tells you:The claim being checked, who made the claim, the name of the publisher doing the fact check, and a summary of the publisher’s fact check’.